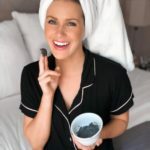 It’s no secret that I am a skincare product junkie & love trying new treatments, so when my aesthetician told me about microneedling I couldn’t sign up fast enough! Microneedling is a very simple treatment that creates small channels in the skin to stimulate your body’s natural ability to heal itself. This process increases collagen and elastin to help with signs of aging, increase epidermal thickness and treat wrinkles & acne scars. SIGN ME UP!! 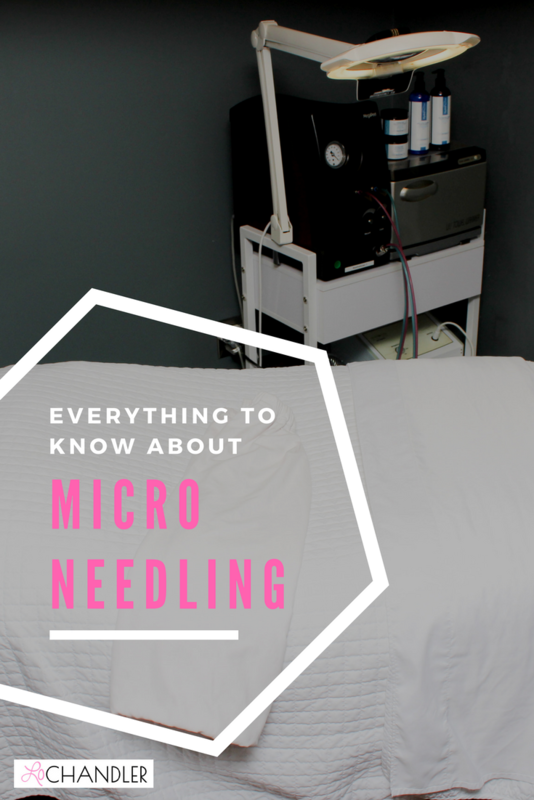 Last year I partnered with Gardner Dermatology & Med Spa to share with you everything you need to know about microdermabrasion, and I’m so excited to partner with them again today to bring you all the details of microneedling! I’m interviewing my aesthetician, Lauren, to share everything you need to know before you book your appointment. 1. What is your title and background? My official title is Licensed Medical Aesthetician and Certified Laser Technician. I graduated from the International School of Skincare, Nail Care and Massage Therapy located in Atlanta, Georgia. I completed extensive training on skincare physiology and histology. Upon receiving my aesthetic license, I completed laser training and received my certification as an Assistant Laser Practitioner. 2. 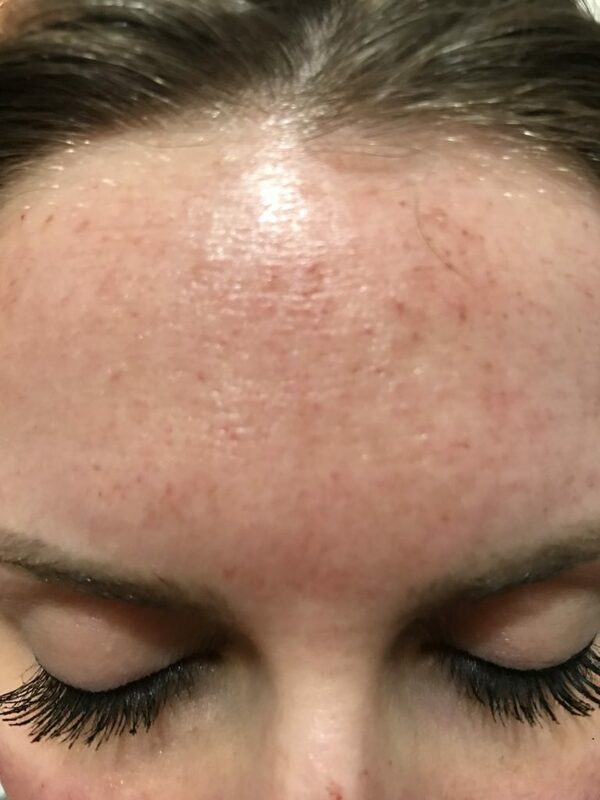 What is microneedling and what it is it indicated for? 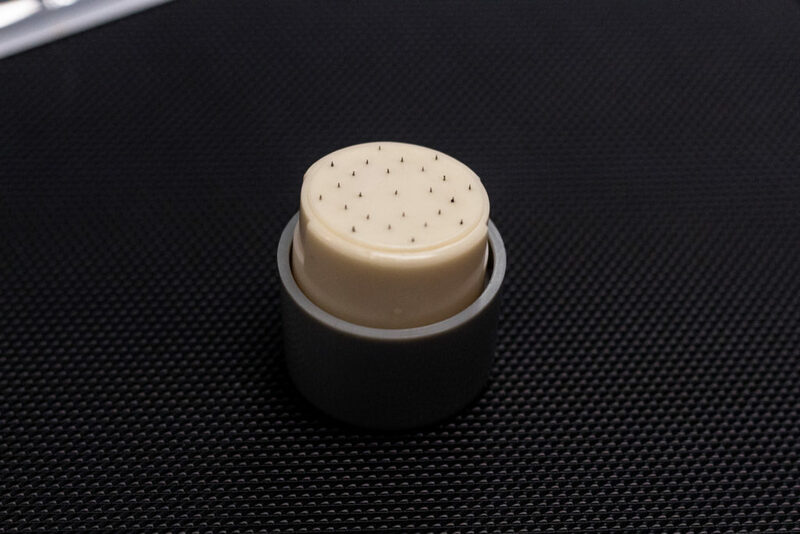 Microneedling or Microchanneling is an in-office treatment that is the process of creating hundreds of tiny, invisible puncture wounds in the skin using microneedles. The treatment sounds scarier than it actually is! It is a very simple and virtually painless treatment and it is extremely effective in treating the signs of aging by smoothing out fine lines, wrinkles and acne scars while also increasing skin elasticity and epidermal thickness. All spas/med spas are different and might have different processes for their microneedling treatments. For our office, we always perform a thorough skin care analysis with each of our treatments. We observe any skin conditions present at the moment and any changes since the last visit. We do a thorough cleanse of the patient along with toning of the skin followed by application of the numbing cream as needed. After the cream has been applied to the skin for an average of about ten to twenty minutes, we remove the cream and tone the skin again. 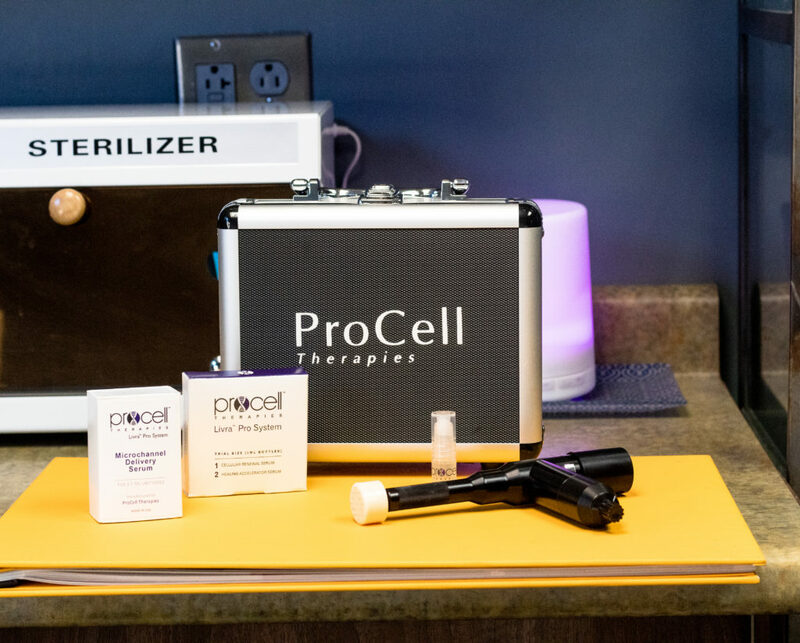 We then perform the microneedling procedure by stamping the skin with the ProCell Therapies Microneedling machine at whichever depth the aesthetician decides is appropriate for that specific patient. While those hundreds of tiny microchannels are open we apply our Microchanneling Delivery Serum. The water based serum is packed with growth factors, hyaluronic acid and stem cell cytokines and is the most advanced anti-aging serum available anywhere. This serum, which contains a high concentration of growth factors, works by entering these tiny microchannels in the skin and enhances production of healthy new skin cells. The entire treatment, including numbing, takes approximately one hour. 4. Who is an appropriate candidate and are there any contraindications? 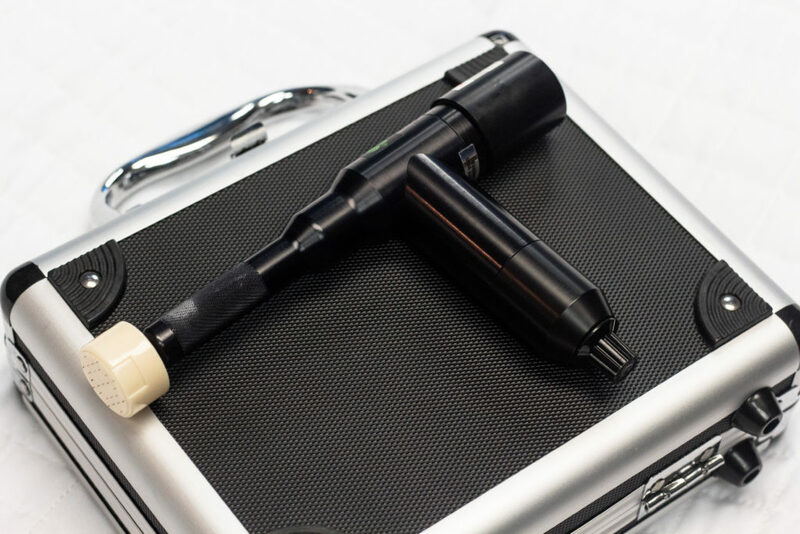 Microneedling is great for a variety of skin types and conditions: oily, dry, acneic, hyperpigmentation, scarring, acne scarring, large pores, stretch marks, rough texture, aging, thinning skin, etc. Since the procedure stimulates new cell production it is excellent for a large variety of skincare concerns from deep acne scarring or pitting to smoothing out fine lines and wrinkles or just to give dull skin a brighter, more radiant complexion. I think the wide range of benefits that microneedling offers is what makes it one of the fastest growing and most sought after treatments in the industry. However, some contraindications for microneedling are as follows: sun burn, recent Botox or filler injections, active and severe rosacea, severe acne (stage 3 or 4), diabetes, auto-immune disorders, eczema, psoriasis and dermatitis. 5. Is there any prep the patient should do before the treatment? 5-7 days prior to treatment, we ask patients to refrain from any exfoliants. This ensures we do not cause any harm to the patient or overstimulate the skin. We also ask patients to avoid any blood thinners, anti-inflammatory medications, fish oils and vitamin E for 5-7 days prior to minimize the risk of bruising and maximize new cell production. No, if the procedure is done correctly and numbing agents are applied beforehand there should be no discomfort whatsoever. That being said, some patients are allergic to the cream or their skin cannot tolerate the ingredients. If that is the case we can perform the treatment with a lower depth setting and still customize it to achieve the desired results. Most patients report that the strongest sensation they experience is a slight vibration on the skin. If we are treating severe acne scarring or want to be aggressive with treatment for a specific goal, we can sometimes increase the strength. A higher strength can make it a little uncomfortable for the patient if no numbing is applied, however this is something that is discussed and agreed upon with the patient prior to the treatment. 7. Are there any special instructions after the procedure? For each microneedling treatment that is performed, the patient is given two take home serums that are very similar to the serum that is applied in office. 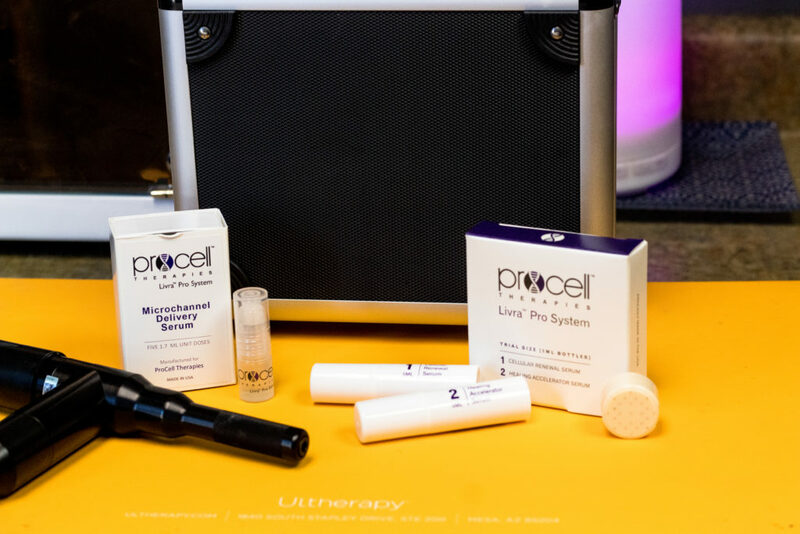 These two products are the ProCell Therapies Cellular Renewal Serum and the Healing Accelerator Serum. They are both packed with even more stem cell cytokines, growth factors and hyaluronic acid. These serums, in my opinion, are liquid gold and increase the patient’s results ten times when used following the microneedling. We ask patients to refrain from any exfoliants and any products containing any exfoliating acids for 5-7 days after treatment. We also recommend that the patient wear a broad spectrum SPF 30 or higher the days following treatment. 8. How often do you recommend Microneedling? Depending on the depth and the aggressiveness of treatment, microneedling can be performed every 4 to 6 weeks. 9. What is the average cost? 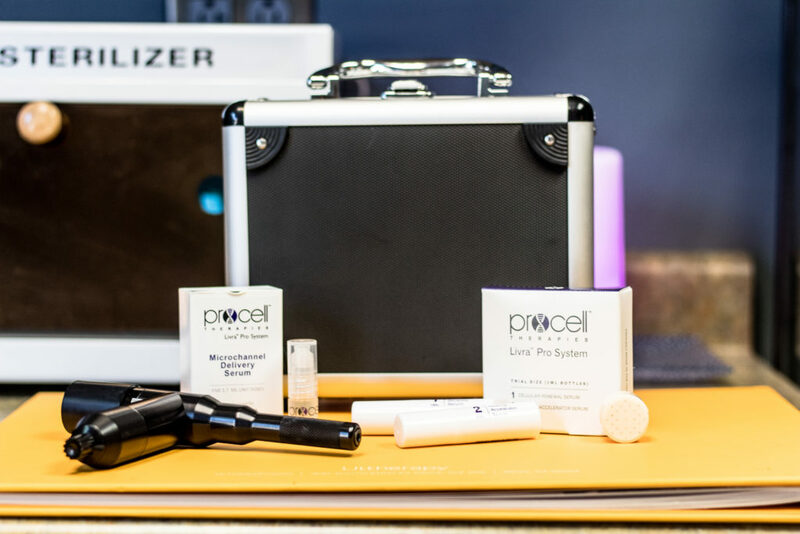 The cost of one microneedling treatment is $300 which includes the travel sized ProCell Cellular Renewal Serum as well as the Healing Accelerator Serum. At Gardner Med Spa we always run different specials for treatments, whether it is 15% off your first treatment with us at the spa or a customized package depending on the number of treatments needed for your specific skin type or condition. We also have payment plan options available as well. 10. If a reader does not live in the Atlanta area, what should they look for when choosing a provider for microneedling? If someone was interested in microneedling, one of the things I would recommend they look for is a medical spa. A medical spa has the capability to sterilize their equipment to ensure patient safety. Additionally, I would look for a licensed aesthetician. This is because they are trained in skin histology and can recognize any contraindications or conditions that may need further evaluation by a physician. I was nervous at first (c’mon, NO ONE likes needles) but it really didn’t hurt because of the numbing cream. My face actually stayed numb for about 2 hours after the treatment! 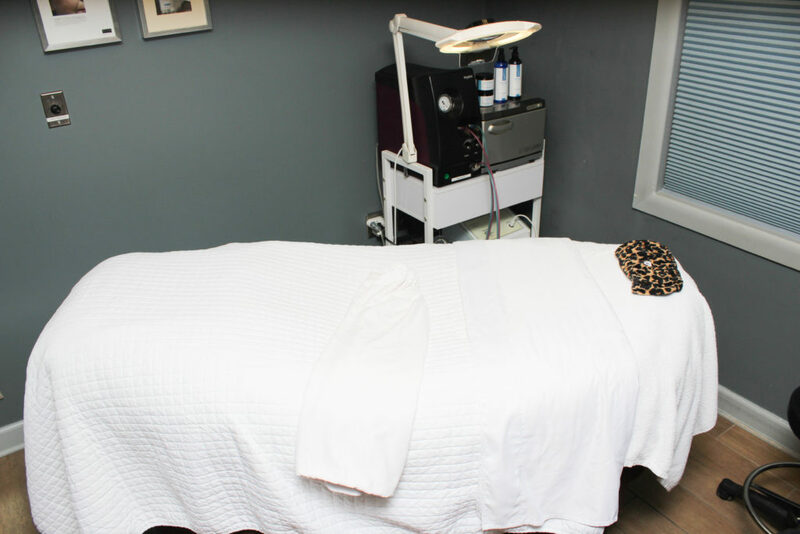 The appointment process is similar to microdermabrasion, you lay down on the relaxing bed (like a massage table) in a dark room with aromatherapy candles and soothing music playing. I swear I almost fall asleep every time before she walks in! Below is a picture of my face taken immediately after the procedure, you can see the needle marks. This was completely gone the next morning. My face felt SO SOFT for the next few days, I loved it. About 4-5 days after, I started to feel like my skin was slightly dryer than usual/peeling in spots. Lauren said this was common and part of the healing..it was also when it was snowing and -5 degrees here so that might have been a factor! A huge thank you to Lauren Kirk at Gardner Dermatology & Med Spa for partnering with me on this post. ( This is NOT sponsored!) I have been going to them for years and genuinely enjoy sharing what they do. If you are looking to step up your skincare routine & are in the Atlanta area I HIGHLY recommend scheduling a consultation with them. My skin has completely changed since I started going. Whether its a facial, a peel or swapping out what products you’re using, the staff at Gardner is highly trained to evaluate your skin and recommend products and treatments custom to what your body needs. Feel free to comment below with any questions, I would love to hear from you! I’ve heard about microneedling and have wanted to try it out!! These Eminence Organics exfoliants are both physical and chemical: WHICH EXFOLIANT IS RIGHT FOR ME? Eminence Organics has many different types of physical and chemical exfoliants to choose from. Hello…I wanted to know how long ll the serums last 30 ml bottle, cellular renewal and accelerator serum if used twice a day as suggested? Also, do these serums need to be used only a week after the treatment or can be used for a month until the next treatment? I’m open for recommendations as my webhost is terrible currently.